Bred by D.T. from “GR. CH. POGI” and “TUKTOK”, a Nigerino-Red Devil, “GR. CH. FOX” began his “career” as a “pet” bull. Southernmen’s FOX vs. Rommel’s BILLY 44 lbs. Now officially named “FOX” by Arnold, his new owner, Fox was rolled against Charly’s “DIESEL” and then was used in three-dogging Jo’s “SLIT” under a noon day sun literally off the chain. After that, Fox was hooked for a match against Rommel’s “BILLY” (off Fat Bill’s “Two Eyes”) at 44 pounds, scheduled for March 29, 1997. Everybody was expecting Fox to lose his first fight since everybody knew of Billy’s lineage – Billy was a dog to be feared; a hard biting, high ability “imported” dog. Arnold still went ahead with Fox’s training despite the death of his father with everybody helping out in any way they can. No one in the group expected to win but everyone wanted to win. “If Fox can’t win, then at least he’ll d**n look good trying” were their words. Fox went into the fight 2 pounds lighter than Billy. 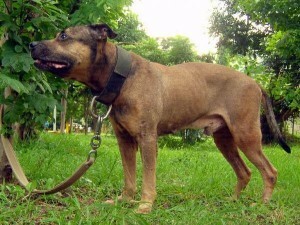 He showed a big heart by refusing to be dominated by the hard biting brindle. And so, after 41 minutes and 6 heart-stopping scratches each, Fox scratched out of his corner like a bat from hell while Billy did not complete his own. And to make it even sweeter, Fox went on to complete a convincing courtesy scratch. This marked the beginning of the legend that is “FOX”. Southernmen’s FOX vs. Pampanga Elite’s CONAN 43 lbs. His second match was on July 1997 against Allan G.’s “CONAN” a 1xW buckskin off M&M’s Jughead X Wildside’s “THELMA LOU” (Phil. ROM). Conan had recently won a convincing match against Carl’s DAGGER, showing good ability, a punishing mouth and superior wind. About two weeks later, Allan called Arnold, wanting to get their dogs hooked up. They were evenly matched at 43 pounds with Conan being the taller and longer of the two. The action was fast and furious as both dogs tried to outmaneouver each another. Fox was the first to get a leg hold which did damage. Conan retaliated by rooting into the chest that shook Fox off his feet. Both are in the best of shape and evenly matched. They took turns being the bottom dog, with Fox slightly ahead by a nose. After 25 min., the pace slows down a bit and both dogs try to catch their breath. The 30 min. mark shows Fox working on a down dog. But as Fox momentarily takes his eyes of the downed buckskin, Conan grabs the front end and shakes so vigorously that Fox was taken by surprise. Fox rolled with the punches and gets a leg of his own, doing even more damage. After 40 minutes and 2 scratches each, Conan was rendered helpless and was unable to continue. And, thus began an intense rivalry between the Southernmen and Allan’s group. 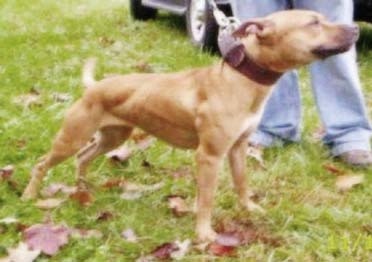 Southernmen’s FOX vs. Stupid Kennel & Mon Cabe’s BULLY 42 lbs. 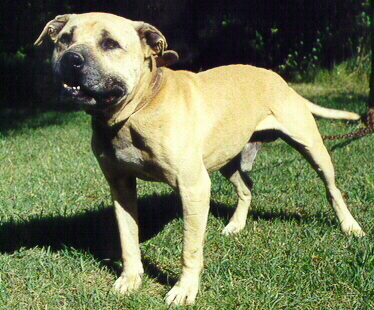 In September 1997, Fox was matched against “BULLY”, a littermate of “GR. CH. POGI”, his sire. This was a fight that was not supposed to happen since Arnold did not want to compete against a dog with practically the same bloodline as his, since it would not prove anything. 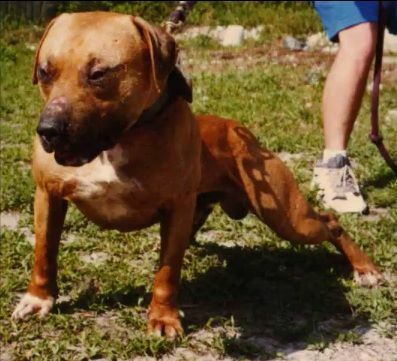 Apparently, after the fight did not push through, Mon C. sold his dog to Stupid Ron after which Ron challenged Fox to a match with his new dog, “BULLY”. He did not inform Arnold though who his dog really was, except that it was a 42-pound buckskin. At this point, Arnold decided to call up Mon C. to set up the match of Fox with Bully. He was not informed that the dog had already been sold but was told instead by Mon that he had no time to condition his dog. So, in his eagerness to have a fight, Arnold accepted Stupid Ron’s challenge even though he did not have any idea who his dog was going up against. It was only a few weeks before the scheduled match that he learned of the true identity of the dog. But this did not deter him from going through with the match since this was what he wanted all along. In fact, he used this as an inspiration to train Fox even better. And Fox was indeed in the best possible condition ever. This was a highly anticipated match that brought out many supporters of Bully eager to watch him destroy this upstart. On the referee’s command to release, Fox immediately shoots for the leg, Bully sidesteps and rides the head; the crowd goes wild. Fox puts out the fire by grabbing the throat and slamming Bully on the floor. Bully gets up and Fox talently leads him across the pit. Bully protests aloud giving away his frustration. Fox welcomes this by shooting for the stifle, alternating with the brisket area. Amusingly, someone in the crowd yells; “don’t worry Bully’s just getting warmed up” After 15 min., of “warm-up”, Bully begins a stumbling scratch, only to be met by Fox halfway through, ramming him into the corner. At the 20 min. mark, Fox was now taking apart this dog that was supposed to stop him. After 22 min., Bully was rendered helpless and unable to scratch. “CH. FOX” became the only second dog to become a Philippine champion and in a record time of less than a year considering that there were no quarterly conventions at that time. Southernmen’s GR. CH. FOX vs. Pampanga Elite’S BANONG 45 lbs. Southernmen’s CH. FOX vs. Popeye’s BRUNO 45 lbs. It was March 1999 that Ch. Fox was again hooked for his “grand championship”. 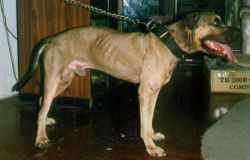 This time an unknown pied dog from Baguio was the challenger: Popeye’s “BRUNO”. The match was again contracted at 45 lbs. to accommodate their challenge. It’s no secret that this dog destroyed many good dogs in rolls. If this qualifies him to be the meanest and baddest 41-45-lb. dog around, then he’s just the dog we are looking for. It was a hot and very humid night in Tarlac and Fox weighed in at 42 lbs. against Bruno’s 45. At the send-off, Fox immediately tried to barnstorm Bruno but got his head chewed in the process by the bigger dog. Bruno proved to be a very good head dog, making Fox work hard for his holds. 15 minutes of swapping and both dogs are still on their feet as Bruno continues to clamp down the side of the head of Fox, making him bleed heavily. Bruno to scratch and Fox meets him halfway, pummeling him backwards. Fox has him in the corner and stays glued to the stifle. Fox is in a blur as he shifts from stifle to throat shaking the hold for what it’s worth. After several more scratches, Bruno is offering no resisitance and takes the count in :22. “GR. CH. FOX” becomes the 2nd Phil. Gr. Ch. after “GR. CH. POGI”, his sire. Gr. Ch. Fox against another dog from Pampanga: Toy’s “BITU”, a black and rangy son of Lone Warrior’s CH. BLACK BART, Jr. The weight was set at 43 lbs. with Fox again giving up a pound. At the send-off, Fox immediately does the barnstorming, but Bitu was quicker and has a terrible mouth. Bitu gets the leg and does severe damage. After a few more minutes, Fox gets tagged on the shoulder and was now getting roughed up. He uses his skill by countering with his own; digging deep into the stifle. This didn’t slow down the black dog as it continued it’s relentless assault. After 20 min., Bitu has built a big lead with Fox on three wheels and springing all sorts of leaks. Fox now changes tactics and goes for the muzzle. While on his back, he clamps down hard and hits a bleeder. This seemed to slow down the black dog and he makes a turn. After several minutes of standstill. Arnold makes a handle, Bitu makes a game scratch. It’s now Fox’s turn to put pressure on Bitu. He does by catching him in the corner before he can even make a step. Bitu tries to counter but Fox sticks to him like glue. After making six game scratches, Bitu has had enough and takes the count at 37:56 min. Gr. Ch. Fox receives a Gamest In Show award. Southernmen’s GR. CH. FOX vs. Eastbloc’s BUKOL 44 lbs. After only 3 mos., Gr. Ch. Fox is again hooked for his 7th at 44 lbs., against Eastbloc’s “BUKOL”, a hard biting 1XW Bolio-Chinaman cross from Arce’s breeding. Fight night, Bukol weighed in a pound heavier as we thought their strategy would be. Not wanting to get denied the match, we collected the forfeit and went ahead as planned even though Fox was still plagued with recurring bouts of babesia and liver problems during the keep. 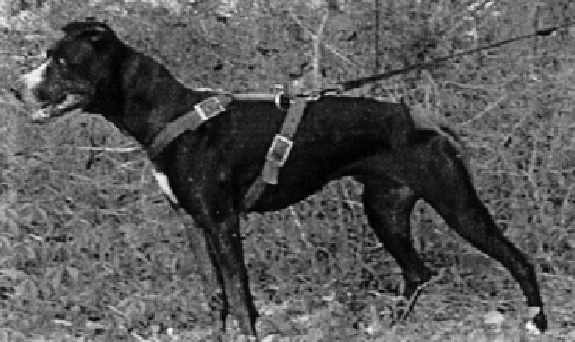 Fox, a dog that had to be killed in order to be stopped, came in at 44 with less muscle tone than usual. Bukol looked like a lean, mean fighting machine at 45 lbs. The venue was packed to the rafters in anticipation of the upset that was coming. 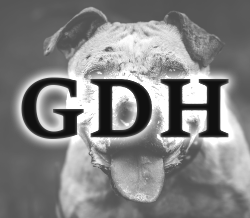 A game, high-ability dog against a pit destroyer. At the release, Bukol had exactly “kill” in mind as they met in the pit. Bukol is all business as he dictates the pace, doing heavy damage on the front and back end. Fox stands his ground but was quickly put back on the receiving end by the bigger dog. The crowd goes crazy, sensing a kill. Fox was all heart as he kept his composure, never making a bad sign. Meanwhile, Arnold knows deep inside the possibility of a pick-up, if the match gets ugly. Fox must finish within an hour or get picked up to save his life. In this weakened state, Fox bided his time and weathered the storm fighting on his back and holding Bukol off long enough to get good holds of his own. At the half hour mark, They were fighting mouth to mouth with Fox having the better hold. Fox clamped down on Bukol and shook the hold for what it’s worth, puncturing the palette. The area is immediately filled with blood making Bukol fight for air. Fox, sensing Bukol’s hesitation pours on the heat. Its now a different ball game as Bukol hesitates on his second scratch. The crowd was dead silent. When the time came to separate the bulldogs from the curs, Fox stood victorious after 38 minutes. After the match, Gr. Ch. Fox was retired for stud as well as for health reasons. His hard fought battles coupled with not enough recovery time eventually took its toll. The result is his not being 100% in his last 3 matches. Gr. Ch. Fox’s real pit weight is 41 lbs. which goes to disprove the old saying: “any good BIG dog can whup any good LITTLE dog anytime”. Gr. Ch. Fox was always open for ALL takers and we never picked any matches. We are here to prove our dog’s worth by going up against the BEST and by so doing we can say that he truly deserves the title “Grand Champion”. Fox produced Ch. Serge’s ELVIS, Ch. GFK LOCA, Ch. GFK’s CRAZY, Ch. Southernmen’s CHIBOG 4XW, 1XL, Ch. Southernmen’s JOEY and numerous 2XW’s and 1XW’s. He passed away just a few years ago.